Who will be the NBA's best and worst big additions? After an offseason full of big moves and All-Stars changing teams, which additions are most and least likely to work out? 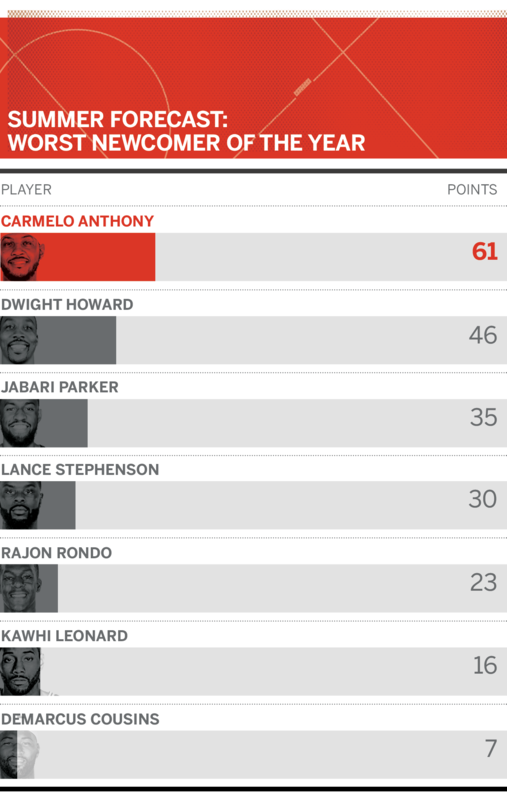 We asked the ESPN Forecast panel to rank its top three choices for 2018-19's best and worst newcomers, featuring LeBron James, Kawhi Leonard, Jabari Parker, Carmelo Anthony and Dwight Howard. L.A. received a three-year commitment from the best player in the NBA to turn around a marque franchise that has missed the playoffs in five straight seasons. While some could question his age (he turns 34 in December), James is coming off one of his finest seasons -- appearing in 82 games for the first time and coming close to averaging a triple double. The opportunity to acquire a top-five player does not come along often. If Leonard returns at his 2016-17 form, Toronto will likely leap to top of the East with a real opportunity to reach the NBA Finals. 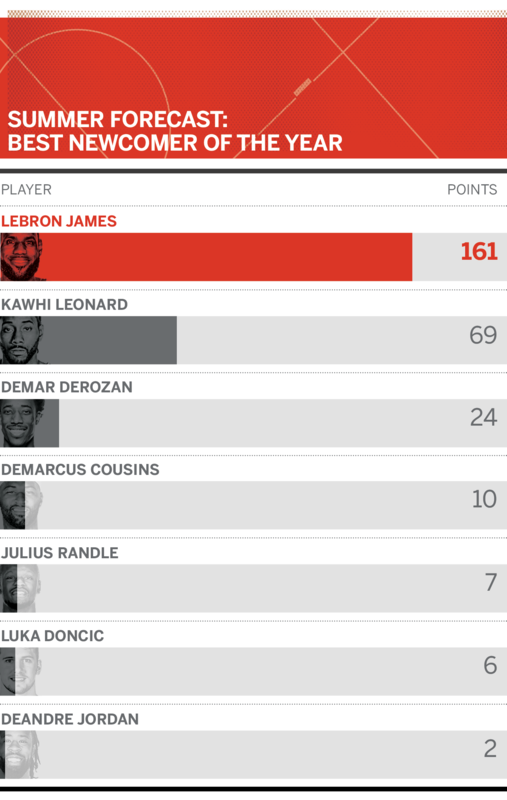 DeRozan gives the Spurs an All-Star in the prime of his career under a long-term contract and who keeps them in the playoff race. On a discounted, one-year, $5.3 million contract, Cousins is on the list even with uncertainty surrounding when he will step on the court following an Achilles injury. Can the 34-year-old Anthony accept the role of being a complementary player? With his lowest usage rate in his career (23.2 percent), Anthony was ineffective when he did not have the ball in his hands in Oklahoma City. A year removed from earning the top spot as worst newcomer, Howard brings stats that actually don't signal trouble. After all, how could a player who averaged 16.6 PPG and 12.5 RPG with Charlotte and is now on a modest, two-year, $10.9 million contract fall on the worst newcomer list? Parker is here more for fit than financials. The last time he left Indiana, Stephenson looked more like a G League player than a key playoff contributor. Now in L.A., Stephenson could struggle adjusting to a role playing off the ball, especially with Lonzo Ball, Rajon Rondo and LeBron James running the show. Will the Lakers get 82 games of the Rondo we saw in the playoffs, or of a player who continues to be a regular-season liability, as evident by his career-worst 109.7 defensive rating in 2017-18? Uncertainty surrounding Leonard's health and long-term status in Toronto places him here. While the risk was warranted, the Raptors will be in a full-scale rebuild if the forward does not return next offseason.